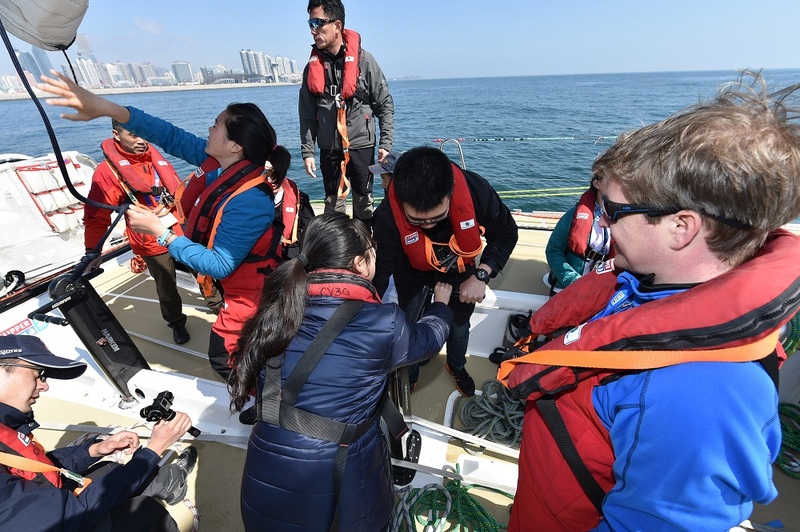 The Clipper Race and our Official Charity Unicef joined forces in Qingdao to highlight a subject China is putting more and more emphasis on; that is the role children have in addressing climate change and creating a clean environment for future generations. With World Water Day taking place on the 22nd March, local students from the Ocean University of China and middle schools from Qingdao and Beijing were invited out sailing and attended a forum entitled “Set Sail for Low Carbon Life” which provided a live discussion on how young people could be a catalyst for action in addressing environmental challenges. After taking the students out on the Unicef yacht, Guo Chuan, the famous Chinese sailor and Clipper 2005-06 Race circumnavigator; joined Unicef Skipper Martin Clough; Unicef Specialist for Water, Sanitation and Hygiene Yang Zhenbo; and Wang Jia from the Qingdao Institute of Bioenergy and Bioprocess Technology of Chinese Academy Sciences; answered questions and shared their experiences and observations of climate change. The forum supported Unicef’s report ‘Unless we act now – The impact of climate change on children’, which shows that 530 million children live in areas where floods are extremely likely to occur and 160 million children in areas where drought severity is high or extremely high. Climate change related droughts and floods can destroy water supplies, or leave them contaminated. A child deprived of adequate water and sanitation before a crisis will be more affected by a flood, drought, or severe storm, is less likely to recover quickly, and at even greater risk when faced with a subsequent crisis. This puts millions of children at risk of death and disease. As part of the Sustainable Development Agenda 2030, Unicef is committed to addressing climate change in its work for and with children. The scope of this work includes advocating with Governments to put in place climate actions that are child sensitive and take children’s needs into account; engage children and youth on climate change and provide a platform for their voices to be heard; and factor climate change into existing programmes to help prevent development gains achieved to-date being reversed. Guo Chuan competed in the Clipper 2005-06 Race and is China’s most recognized sailor. He reminded audiences of the wonders of the sea and his experiences sailing on oceans. Reflecting on his recent artic sailing mission, he said “On one hand in the past decade the rapid melting of the ice in the Artic, makes sailing there possible but on the other hand, it is a sign of global warming, that adds new challenges for the environments on which humans and animals rely on for their survival.” He hopes the younger generation can increase their awareness of environmental protection and act to address climate change and the impact on our collective future. In China, Unicef is working with partners including the NDRC Climate Change office to engage young people into policy dialogue and decision making. It aims to increase investments in education, training and awareness-raising of children on climate change which will help empower them as important stakeholders and agents of change. The Clipper Race is the world’s largest and longest ocean race. Powered almost entirely by wind, it is one of the most environmentally friendly forms of travelling around the planet, and allows people all over the world a rare opportunity to experience and explore the power and beauty of the world’s oceans. 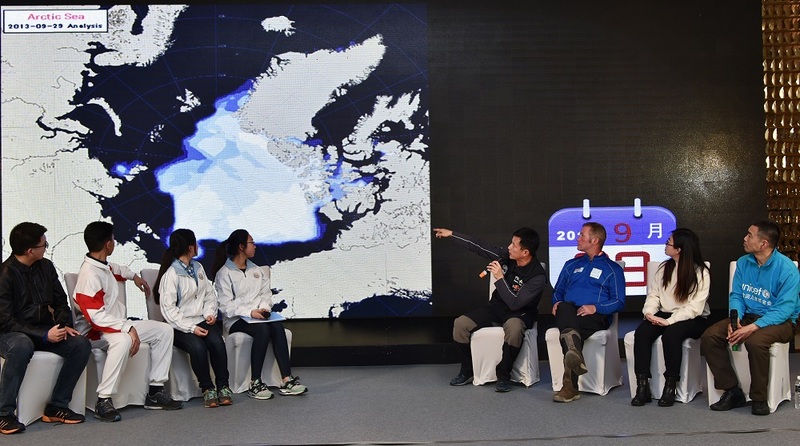 Race 9 sets sail from Qingdao to Seattle on 20 March, meaning that by World Water Day, crew will be in the early stages of their 6000+ nautical mile journey across the biggest expanse of water in the world, the Pacific Ocean, which is expected to take 31 days to complete. Since the Clipper Race left London crew have been fundraising throughout their journey and have now raised over £176,000 for children in danger around the world. Click here to donate and help them reach their £300,000 target. Click here to find out more about Unicef's work around the world.